The quest for Palestinian independence appears to be simultaneously at death’s doorstep and stronger than ever. At the granular level of on-the-ground realities and national policies, the very existence of the Palestinian national cause as a coherent and even extant political programme appears increasingly tenuous. Yet at the same time, the emerging state of Palestine is becoming increasingly recognised, and almost universally accepted, as a part of the international community, a participant in major multilateral organisations and an integrated fixture in the global diplomatic environment. Israel’s government has dropped all pretences. The appointment of right-wing extremist Danny Danon to be Israel’s ambassador to the United Nations confirms that prime minister Benjamin Netanyahu’s statement during the last Israeli election categorically opposing the creation of a Palestinian state was an accurate representation of policy. Mr Danon is a strident opponent of peace who instead advocates the annexation of as much territory in the West Bank as possible with “the minimum number of Palestinians”. Mr Netanyahu and his colleagues know exactly the message – so blatant that it is actually crude – that they are communicating by sending Mr Danon to represent Israel in the UN. To engage with the centre of international support for, and expectation of, peace based on two states, Israel is dispatching one of its most strident annexationists. It is no longer possible to argue honestly that Israel’s government is open to, let alone supportive of, peace with the Palestinians. And there is no basis for hoping that this is a temporary aberration that will be corrected in future elections. Supporters of the status quo such as Mr Netanyahu are fighting off those, like Mr Danon, who want to annexe Palestinian land. A majority of Jewish Israelis might still favour peace. But various shades of extremism have captured the policymaking process, and only a dramatic set of developments could significantly alter that. As Israelis are turning away from any notion of accommodating the Palestinian national movement, Palestinian leaders themselves appear to be further burying, rather than rescuing, their own cause. President Mahmoud Abbas has recently sprung into uncharacteristically vigorous action. But his energies have been focused inward, on consolidating his own authority and attempting to purge both real and perceived rivals. He is increasingly acting like the autocratic mayor of Ramallah rather than the responsible national leader of Palestine. Appearances notwithstanding, Mr Abbas’s recent resignation from the Palestine Liberation Organisation executive committee, along with nine other members, is almost certainly a ploy to purge his critics and strengthen his control of the PLO. Worse, Mr Abbas has escalated his long-standing feud with former Fatah leader Mohammed Dahlan into a vendetta against two of the most responsible and respectable Palestinians political figures. Long-serving PLO secretary-general Yasser Abed Rabbo has been summarily dismissed from that post. His NGO, the Palestinian Peace Coalition, was raided and closed, drawing angry rebukes from its European funders. Former prime minister Salam Fayyad has also been a target, with repeated efforts to seize funds belonging to his organisation, Future for Palestine. With Hamas lurching from crisis to crisis, and offering no plausible alternative to the Palestinian people whatsoever, Mr Abbas has squandered numerous opportunities to reintroduce the Palestinian Authority into Gaza in a number of realistic capacities. But all of these subtle and complex opportunities would have required adroit and delicate diplomatic handling and involved considerable political risk. Sadly, Mr Abbas has preferred to chase shadows in Ramallah and issue empty threats about the International Criminal Court. Palestine is increasingly accepted as a diplomatic reality at the highest theoretical levels. The chair is fluffed and the nameplate polished and waiting for the representatives of Palestine in countless multilateral forums the world over. But the painful process of actually creating a Palestinian state – which perforce involves getting Israel, through a complex and difficult process, to reverse itself and accept and facilitate this outcome – has strikingly receded from the international, and even the Arab, agenda. This dire Palestinian national crisis requires a response from a strong and assertive national leadership. However, Mr Abbas hasn’t been behaving like a national leader. And Hamas, which is infinitely worse in every respect, is currently making itself available to the highest regional bidder – although whether they prefer to be paid in cash or guns depends on which faction is bargaining. Israel has dismissed Palestinian statehood, although without proposing an alternative. It’s possible that a sustained period of Israeli opposition to a two-state solution might even induce the United States itself to de-prioritise its own commitment to that outcome, rather than Washington pressuring Israel to accept the need for peace – especially since the Palestinians themselves lack a national leadership that is pursuing their own cause with any degree of seriousness. 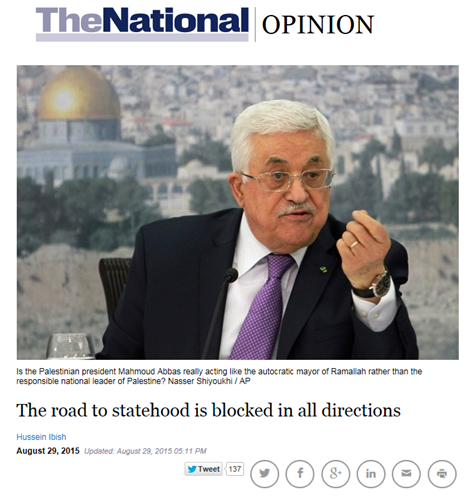 The world clearly expects the creation of a Palestinian state. That expectation is meaningful and has significant long-term implications. However, events on the ground, and the attitudes and conduct of both the Israeli and Palestinian leaderships, point to a very different and extremely dangerous future. Viewed from that perspective, the cause of Palestine appears to be a rapidly vanishing aspiration.